Mike Trout, Aaron Judge and Mookie Betts form a dream outfield for the American League. Bryce Harper and Max Scherzer make up a not-so-gracious welcome committee for the NL. 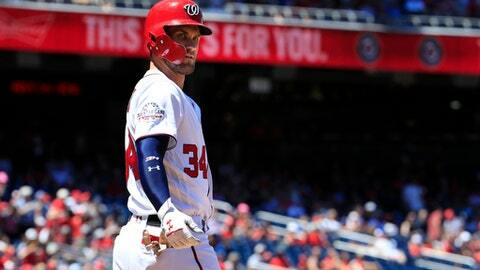 Baseball unveiled the rosters for its midsummer showcase Sunday night, featuring an imposing AL lineup and Harper starting at his home ballpark in Washington. ”It’s fun. You’re playing but you’re looking around because you’re playing with all those big boys out there,” said Altuve, who made the AL team for the sixth time. Torres is on the disabled list with a hip injury and unlikely to participate. While he and Albies are just 21 years old, the list of 25 first-time All-Stars also includes thirty-something surprises like Boston first baseman Mitch Moreland, Texas Rangers slugger Shin-Soo Choo and Atlanta outfielder Nick Markakis. But that’s just the beginning for the AL, which has won five All-Star Games in a row and 17 of the last 21. Altuve led the fan balloting with 4.8 million votes. Baltimore Orioles shortstop Manny Machado will make the short trip down to D.C. for the July 17 game with speculation increasing about his future ahead of the trade deadline. Chicago White Sox first baseman Jose Abreu, Cleveland Indians third baseman Jose Ramirez, Red Sox designated hitter J.D. Martinez and Tampa Bay Rays catcher Wilson Ramos round out the AL’s starting lineup. ”The best part is being with all the guys. You’re on the biggest stage with the best,” said Trout, who was selected for the seventh straight year – tying Boston ace Chris Sale for the longest active streak. ”That’d be an unbelievable experience,” he said in an interview on ESPN. Candidates for the final AL slot are Red Sox outfielder Andrew Benintendi, Twins outfielder Eddie Rosario, Mariners shortstop Jean Segura, Angels shortstop Andrelton Simmons and Yankees slugger Giancarlo Stanton. ”It’s something I’ve watched for a long time. To be a part of it would be pretty cool,” Benintendi said. Markakis and Matt Kemp will join Harper in the NL outfield. Kemp’s return to the Los Angeles Dodgers has been a smashing success. Markakis has been a key performer for the Braves and made an All-Star team for the first time in his 13 major league seasons. As usual, there were some notable snubs – with several changes surely coming due to injuries and withdrawals. Tampa Bay left-hander Blake Snell, who is 12-4 with an AL-best 2.09 ERA, was the most incomprehensible omission. Houston right-hander Charlie Morton and Oakland Athletics infielder Jed Lowrie were also left out despite worthy credentials. The Philadelphia Phillies, percentage points ahead of the Braves for the NL East lead, had only one All-Star in pitcher Aaron Nola. ”Having to have every team represented I think presents a bit of a problem for Major League Baseball,” Astros ace Justin Verlander said. ”I think it’s not necessarily always the guys that are having the best years. I think especially in the game today where you have some teams that are tanking, I think it makes it kind of difficult. AP Sports Writer Kristie Rieken in Houston and AP freelance reporters Kollin Miller in Kansas City, Missouri, Jill Painter Lopez in Anaheim, California, Brian McNally in Washington, Anthony Totoraitis in Milwaukee and John Jackson in Chicago contributed to this report.